Sax’s powerful novel tells the story of a Jewish teen named Misha, whose family, like the rest of the Jews living in Warsaw during World War II, has been moved by the Nazis into a single crowded ghetto. Conditions are appalling: every day more people die from disease, starvation, and deportations. Misha does his best to help his family survive, even crawling through the sewers to smuggle food. When conditions worsen, Misha joins a handful of other Jews who decide to make a final, desperate stand against the Nazis. This is the third year in a row that an EBYR title has been honored by the Mildred L. Batchelder Award committee. Soldier Bear (written by Bibi Dumon Tak, illustrated by Philip Hopman, and translated by Laura Watkinson) won the award outright in 2012; Son of Gun (written and translated by Anne de Graaf) was named a Batchelder Honor book in 2013. In addition, Garmann’s Summer (written and illusttrated by Stian Hole) was a 2009 honor book. 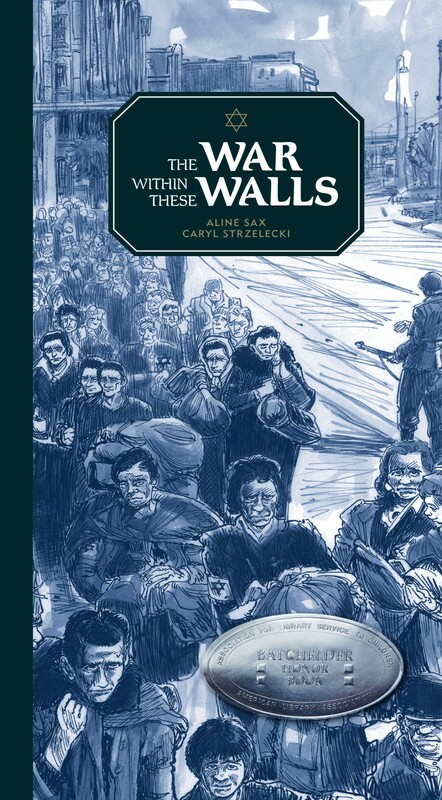 Prior to this latest accolade, The War within These Walls also won the 2013 National Jewish Book Award for Children’s and Young Adult Literature and received starred reviews from Publishers Weekly, School Library Journal, and Kirkus Reviews. Caryl Strzelecki’s illustrations for the novel were also honored by inclusion in the Society of Illustrators’ 2013 “The Original Art” exhibition. We offer our sincere thanks to the American Library Association and our congratulations to Aline Sax, Caryl Strzelecki, and the staff of Eerdmans Books for Young readers. A special note of appreciation goes out to translator Laura Watkinson, whose work with EBYR has now garnered two Batchelder wins, and whose name was read twice from the awards podium this morning: once for The War within These Walls and once for Batchelder Award winner Mister Orange (Enchanted Lion Books). It’s one of three EBYR titles (along with Nasreddine and The Chickens Build a Wall) to have been included on the United States Board on Books for Young People (USBBY) Outstanding International Books list. It’s one of two EBYR titles (along with A Girl Called Problem) selected for the 2014 Notable Social Studies Trade Books for Young People list, an annual reading list administered by the National Council for the Social Studies (NCSS) and the Children’s Book Council (CBC). Click to order Aline Sax’s The War within These Walls, to read an EerdWord post about the book (“A Story We Had to Share“) by EBYR managing editor Kathleen Merz, or to watch the book trailer.